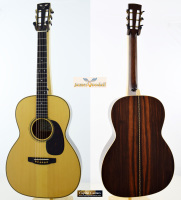 Offered for your consideration is this marvelous traditional style 000-size guitar built by James Goodall in his Hawaii shop in 2006. 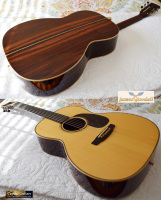 This a 12-fret, short (25") string scale instrument. 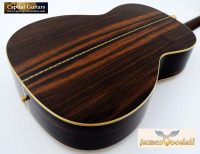 It has a premium grade Adirondack Spruce top matched with Macassar Ebony for the back and sides. It has Maple binding with herringbone purflings and rosette. 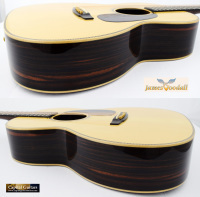 It has an oval-shaped Mahogany neck. 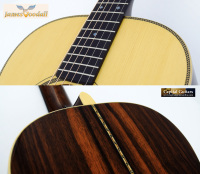 The fretboard is Ebony with a 16" radius, Abalone inlays and a 1-13/16" bone nut. The slotted headstock has Maple binding, an Ebony overlay and Abalone logo inlay. 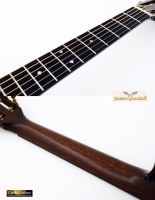 It has an Ebony bridge with a bone saddle and 2-5/16" string spacing. 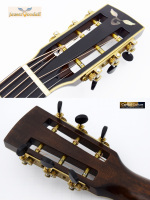 The tuners are engraved Waverly side mounts with Ebony buttons. With it's 15-3/16" wide lower bout, this 000 moves some air. It is loud with a clear and balanced voice and great note separation. As a Goodall, overtones are plentiful. Please check out the brief sound sample provided, this guitar has a voice that is both sweet and powerful. This fabulous instrument remains in great condition despite having been completed in 2006. 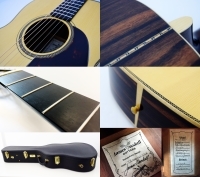 It shows only light evidence of play including some string change scratches on the Ebony headstock overlay and very light shirt button scratches on the back. These flaws are minor and very hard to find, even very close up. The frets show only very light evidence of play. It comes in it's original Cedar Creek case, also in great condition. 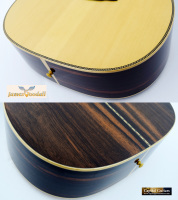 Jean Goodall advises that it would cost $10,650 retail to commission this guitar today with these options. Get this exceptionally well maintained 2006 beauty for thousands less. 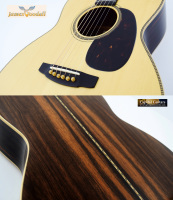 Make this incredible Goodall yours today!